In this week's Monday Map, we take a look at the size of each state's rainy day fund balance prior to the beginning of the recession in 2007. 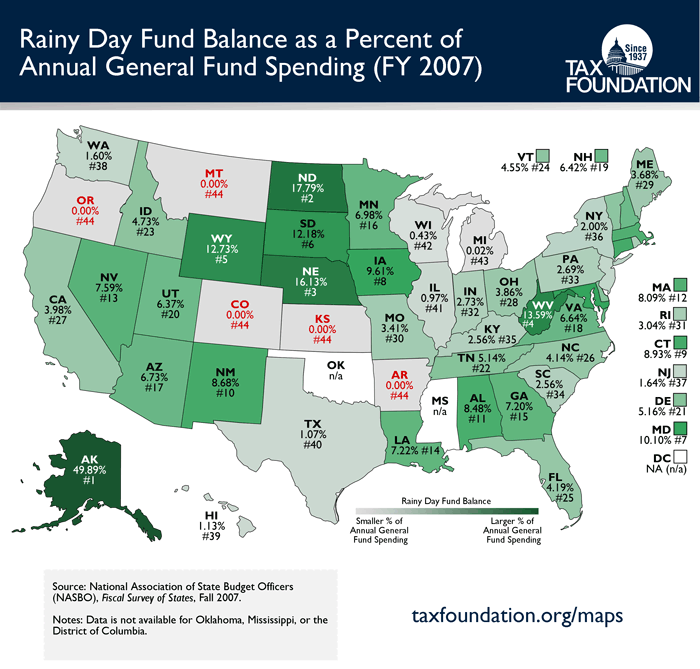 The map illustrates a state's rainy day fund balance as a percent of its annual general fund spending. Oregon, Montana, Colorado, Kansas, and Arkansas were the least prepared for economic hardships with rainy day funds equal to 0% of their general fund spending. Not far behind were Michigan (0.02%), Wisconsin (0.43%) and Illinois (0.97%). Certain states, however, were much better prepared. Alaska's rainy day fund was by far the most secure; prior to the recession, it was equal to 49.89% of the state's general fund spending. Next best prepared were North Dakota (17.79%), Nebraska (16.13%), and West Virgiia (13.59%). Stay tuned next week, when we will take a look at rainy day funds for each state in 2013.